(Greenwich, CT)- One of the more popular end-of-season offshore races on Long Island Sound is the Indian Harbor YC’s infamous “Gearbuster Race”. The race sounds easy, just a 46.0nm course eastward down the Sound from Greenwich, CT to Stratford Shoal and return. Some years, the fleet can take a beating on swift-moving storm fronts. This year, it was pretty benign and very quick for some boats. The report from Drew Hall’s J/88 NEVERMORE was similar to their colleagues on HORNET. Said Drew, “we had a scream in the IHYC Gearbuster on our J/88. We were 1st in PHRF 3 Class beating 49-foot boats and were 11th overall. In addition to the J/88, other J/crews had a great race. 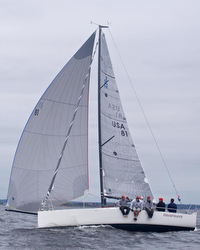 In the PHRF Doublehanded Class, Barry Purcell’s J/27 LUCIDA won their fleet of eleven boats. Then, in PHRF 2 Class, Brian Spears’ J/120 MADISON took the bronze on the podium. Add to Flipboard Magazine.